This year’s Tinos World Music Festival honoured the world’s most popular, familiar and widely played musical instrument, which has also accompanied mankind’s lyric moments for centuries. As every year, the 5th annual Festival was held in Chora over the Pentecost weekend, from 2-4 June. Classical or acoustic, electric or fretless, with six, eight or even ten and more strings, the guitar is generally associated with Western music, both classical and modern. But over the past decades, it has also played an increasing role in traditional, non-Western musical contexts. 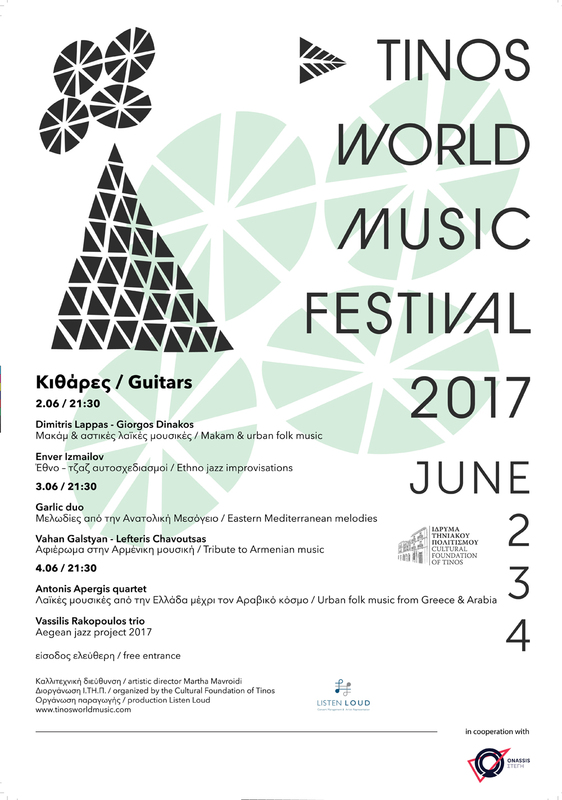 It is this less well-known aspect of the guitar that the musicians invited to this year’s Tinos World Music Festival will be spotlighting through their wide-ranging musical quests and approaches. On the first night (Friday 02.06), Dimitris Lappas and Giorgos Dinakos explore the directions guitar has taken in the urban folk music sounds through improvisations in makam and folk paths. In the second part of the night, soloist Enver Izmailov, internationally known and multiple award-winner, uses his guitar as a “polyphonic” instrument in his very own playing technique and improvisation. On the second night (Saturday 03.06) the distinguished Armenian duduk soloist Galstyan Vahan, with guitar player Lefteris Havoutsas, present a unique tribute to traditional Armenian music, whereas Theodora Athanasiou and Pavlos Spyropoulos, known as ‘Garlic Duo’, bring compositions from the wider eastern Mediterranean area, remixed for bass and contrabass, on the Cultural Foundation’s stage. On the third and last night of the festival (Sunday 04.06), Vassilis Rakopoulos (classic guitar), Harris Lambrakis (ney) and Angelos Polychronou (drums) improvise with the melodic and rhythmic idioms of the Cyclades and the wider Mediterranean area, introducing us to the atmospheric world of Aegean jazz. Last but not least, Antonis Apergis (electric and fretless guitar) and his quartet, perform compositions that blend elements of Greek folk and Arabic sounds.